Gluten-Free Sticky Toffee Pudding Cake! 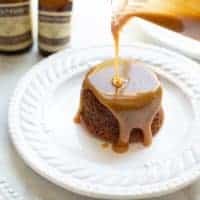 Moist date cakes covered in a decadent, buttery toffee sauce. A show-stopping (but easy!) holiday dessert everyone will love. In a medium bowl, combine the dates, boiling water, baking soda and vanilla. Let the dates soak for 15 minutes. Preheat the oven to 350F (177C). Lightly grease 8 ramekins (I use 6oz ramekins) with cooking spray. Place on a baking sheet. In a medium bowl, combine the gluten-free flour, baking powder, salt and nutmeg. Whisk to combine. In a large mixing bowl, add the butter and brown sugar. Using a hand mixer, beat the butter and sugar until fluffy and combined, about 1-2 minutes. While mixing, add the eggs one a time mixing after each addition. With the mixer on low, add 1/3 of the dry ingredients and mix to combine. Add 1/2 of the date mixture and mix. Add another 1/3 of the dry ingredients followed by the other 1/2 of the date mixture, and mix. Add the final 1/3 of the dry ingredients and mix until totally combined. Divide the batter evenly among the ramekins. Bake for 22-26 minutes or until a toothpick inserted into the center of each cake comes out clean. Let cool for at least 15 minutes (or more) before plating. Meanwhile, melt the butter over medium heat. Whisk in the sugar and salt. Then cook, whisking constantly, until the sugar dissolves and the mixture looks puffy, about 3-4 minutes. While whisking, slowly add the cream. Continue to whisk and bring the mixture to a simmer. Cook for about 3 minutes until thick. Remove from the heat and stir in the vanilla bean paste. Pour into a serving container or a jar for storing. Serve sauce warm. Sauce can be made up to 2 days in advance then reheated. Serve the cakes by turning the cake out onto a plate. Pour over some of the warm sauce and a drizzle of heavy cream if desired. Enjoy!